Amazing tours along Ho Chi Minh Trail - 10 days is the best journey in Vietnam, with the historic Ho Chi Minh trail, the path of dew, blood and tears of Vietnamese people. 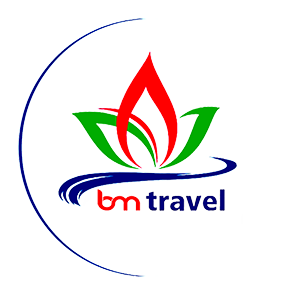 This journey will definitely make your travel days in Vietnam become more meaningful. The Ho Chi Minh Trail Vietnam is a 3000 km road that connects North and South Vietnam. Having had strategic significance during the Vietnam-American war, it's by no coincidence that this trail takes you through numerous cultural and historical landmarks along the length of Vietnam. This Vietnam Motorbike Tours from Hanoi to Hoi An will take you across Northern and Central Vietnam, from mountains to beaches, forests to highlands, and show you the raw beauty of Vietnam changing from one road turn to another. You'll trace along the open highway, trek treacherous back-roads, scale sky-high mountain passes, and navigate lively jungles. Unlike the majority of tour operators that would stick to the easy route (National Highway 2, National Highway 70), we picked out a combination of much more exclusive and quieter routes that leads you through quaint back-roads and pristine off-road tracks all the way to Thac Ba. Once we get there, we’ll hop on a boat ride around Thac Ba lake, join in the simple yet exciting life of the local Dao, and spend the night with a local family. we will finish first day riding with Vietnam Motobike Tour Club Team with safe and fun and before sun set. We will be driving through rice terraces draping over hillsides, back-to-back winding passes, and fruit gardens that stretch as far as the eyes can see. We’ll be stopping at an orange garden so you flaunt your photography skill and taste the sweet nectar of the region, as well as talk to the locals ethnic minorities. we can have some Offroad tours option for who want to try a little funny road and muddy road. so that you can have more interesting experineces riding throught untouch local villages and untouch Offroad Route. that the way we organize amazing Northern Vietnam Motorcycle tours. We’ll continue our journey with a cloud-hunt at some 2000 meter above sea-level in Ta Xua commune. Over the course of our quarter hour hunt, you’ll witness an ever-changing sea of cloud under-foot. This will take your breath away, but it’s only for the skilled. Afterwards, we’ll ride along the Black River, taking in the beauty of mountains and river bank. We’ll cross the river on Van Yen ferry, and arrive for lunch at either Bac Yen or Moc Chau. Once lunch is done, we’ll continue to exploring Moc Chau plateau with its green-draped tea hills, peach hills, and apricot hills. We’ll can also head to the peak of Hua Tat pass for the breathtaking view there. From then on, we have various route to Mai Chau for your choosing. Some are safe, easy riding, while others are beautiful off-road that demands a lil more experience than usual from our riders. 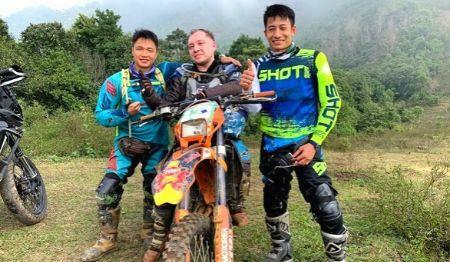 Many options for each riding group, and this kind of tours is mixed on road and Offroad riding, so depend on skill group we have more chance to try hard Vietnam Motorcycle Tours or easy and above depend on time and weather we got. Chose one amazing motorcycle Tours with Vietnam Motorbike Tour Club Team will be a great choice so far for all riders in all over the World. Homestay at Thai people house. After breakfast and bidding farewell to our friendly Thai hosts, we’ll continue our tour to the Southwest of the region. There aren’t many things more therapeutic than driving along Ma river, across rice fields, sugarcane fields, and bamboo forests. 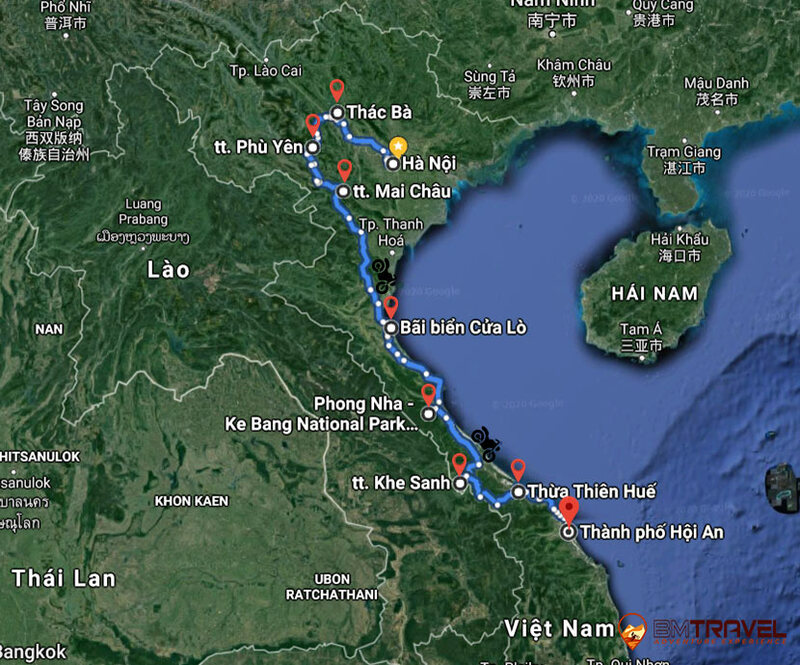 After hours of braving bumpy roads and seductive scenery, we arrive at the Ho chi Minh trail the South bounds legendary route during the Vietnam-American war. Despite having been considerably repaired and renovated, this trail still possesses indescribable views on both side of the road. If the Northwestern region is full of imposing yet spectacular mountains, then this North-eastern area - also known as the Ha Long bay on land, is famous for its limestone mountains laced with corn and cassava fields. Time for a change of scene. Bidding goodbye to the humbling feeling of snuggling up in between ranges of stoic mountains and vast cradling valleys, we’ll be riding along the coastline of Central Vietnam. We’ll trace the length of winding roads that lean against mountains looking out over the pristine beaches like the prettiest muse lying back on a penthouse balcony with premium seaside view. Just after lunch, we’ll reach Dong Loc T-junction, a vital strategic road point in the VIetnam-American war. We’ll continue along Ho Chi Minh trail from then on, getting closer to the Vietnam-Laos border with more and more limestone mountains. We’ll reach Son Trach Commune just outside of Phong Nha Ke Bang National park at 4:30 pm. If time and weather permit, we will take a boat ride to explore one of the biggest caves in the world, among this unique world heritage cavern system. Phong Nha Ke Bang is a national park and UNESCO World Heritage Site situated in Quang Binh province, North Central Coast of Vietnam. Home and shelter for the world’s two largest karst region with 300 caves and grottos, Phong Nha Ke Bang still holds her deepest secrets from the world with many areas still not well-explored. Named after the two major sections of the park: Phong Nha caves and Ke Bang forest, the national park houses the world’s largest limestone cavern system with the longest underground river, including the largest cave in the world: Son Doong. Phong Nha cave (or wind-tooth cave, owing to the underground air currents that whistle through teeth of stalagmite and stalactites) is the oldest major karst in Asia, with formation dates tracing back to the Palaeozoic era 400 million years ago. Phong Nha is one of the finest and most distinctive complex karst landform in Southeast Asia, with dissimilar geomorphic, geologic, and biotic conditions comparing to others karst world heritage sites. Whatever spiritual or inspirational catalyst you’re looking for, you’ll probably find it here basking in the faint ambience of rushing and dripping water and the vast closeness of the limestone cavern walls. Unlike the majority of tour operators around who would choose the new Ho Chi Minh trail Vietnam, we’ll take you through the old route Westwards across Ke Bang forest in the Phong Nha Ke Bang National Park. This trail was carefully concealed during wartime to avoid US and South Vietnam troops. Over the course of 200 km, you will scarcely see people, let alone bikes. You might, instead, spot a few wild animals, pristine forest land, and paramount mountains. Once we clear the forest, we’ll arrive at the former US army base in Khe Sanh. This was a hot zone and a strategic location during the Vietnam-American war. We’ll stroll around the old air base, Marine base, and visit Khe Sanh museum. After lunch, we’ll continue along the central coastline to Hue city. If time permits, we’ll stop by Quang Tri ancient citadel for a quick tour. We won’t be riding much today. In the morning, we’ll join a boat tour on Huong river (Perfume river) and visit the sacred Thien Mu temple. After that, we’ll tour the royal citadel and Nguyen kings’ mausoleums, and other landmark in this poignant ancient capital. Or we can dive into the culinary scene, and enjoy the special bun bo Nam Bo, the many distinctive Hue cake snacks, and many of Hue special cuisines. Saying goodbye to Hue, we drive Southwards Hoi An. We’ll come across Phuoc Tuong and Phu Gia passes, as well as the beautiful Lang Co beach before reaching Hai Van pass - one of the most beautiful coastline in the world. If the weather is fine and clear, you may be able to see Hue and Da Nang city from a distance! Then we’ll continue along Da Nang beach and end our day in Hoi An. We’ll start our last day with a gentle walk around Hoi An and its Old Quarter landmarks. We can also join a boat ride on Thu Bon river around the city. After lunch, we’ll head back to Da Nang and end our 10 day tour at a hotel. Vietnam Motorcycle tours along Ho Chi Minh Trail - 10 days is a long journey with many difficult challenges but an unforgettable experience for travelers in Vietnam. 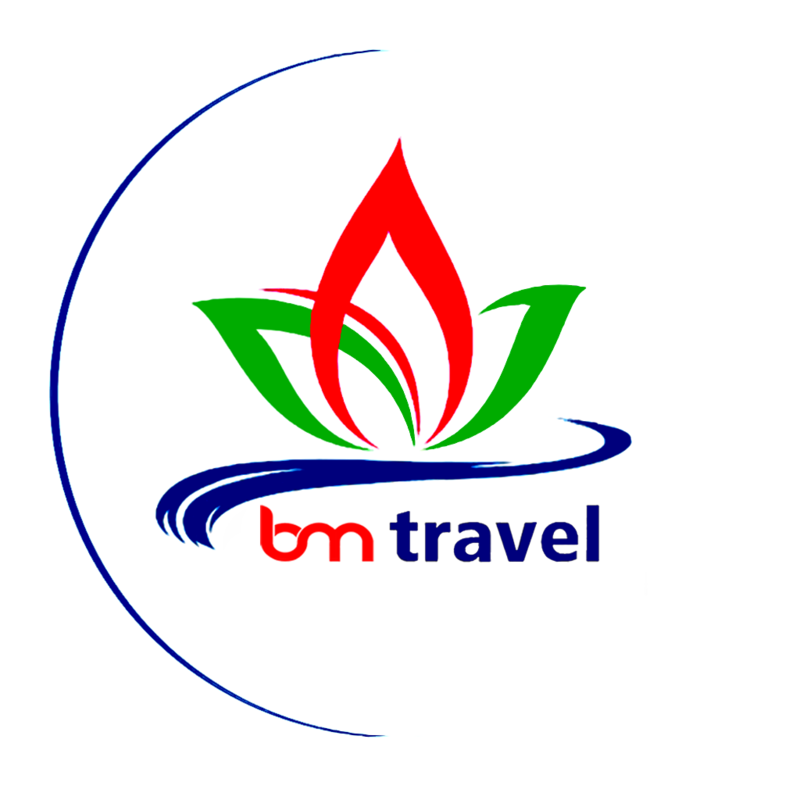 Please Contact us and we will organize a most memorable journey. Unique & Hidden Routes, Customized Tours! 1. Prices for Inclusive Motorbike Tours in North Vietnam (Tour by Honda Motorbikes from 125cc to 150cc). Motorbike Tours Ho Chi Minh Trail Cost Higher. 2. Tour on new CRF250cc cost extra, please contact us to get the best price! 3. Tour with Spanish speaking tour guide cost Higher, please contact us to get best price. + Single stay will cost 20 USD extra/ day. > If you cancel the Vietnam motorbike tour before the departure date, you will lose 100% of the deposit. > If you cancel the tour after the departure date, you will lose 100% of the total cost/ fee of the tour for any reason. > After departure, NO REFUNDS will be given for any reason, if you cancel the tour. > A Damage Cost deposit of US$ 100 – 1,000 or more is required for each motorcycle for using in the guided or self-guided motorcycle tours. In case of a self-caused accident, your own participation is up to US$ 2,000 or more. + the tour not such a long one but past the typical places of north and center of Vietnam, especially of the route of Ho Chi Minh and places like Mai Chau valley, Phong Nha Ke Bang, Hue, Da Nang, ..
+ better understand war between Vietnam and Americans, especially about the devastating war which Vietnam had been passed.